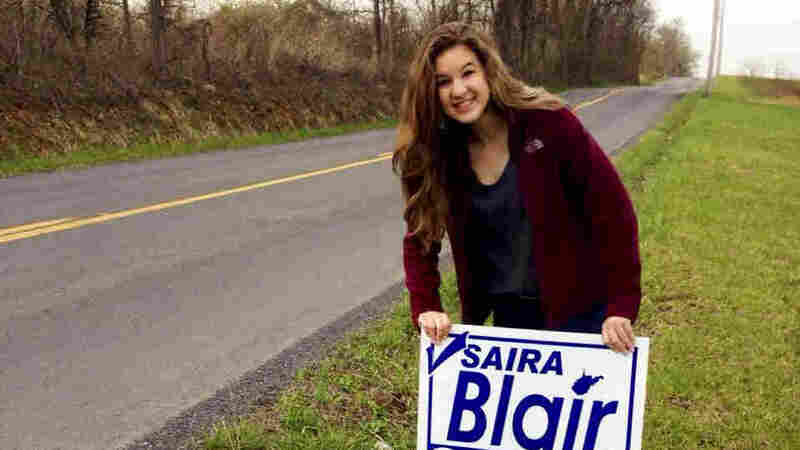 Meet The High School Student Who Took Down A State Lawmaker : It's All Politics A week before graduating from high school, 17-year-old Saira Blair won the GOP primary in a conservative West Virginia district. Even the incumbent she defeated concedes she outworked him. 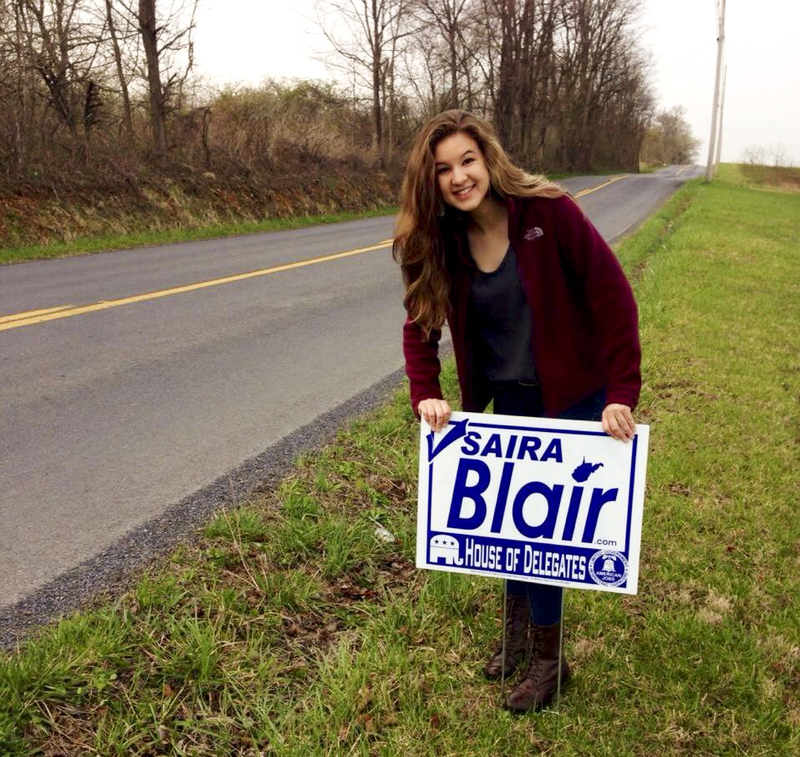 The incumbent state legislator who lost to Saira Blair acknowledged that the 17-year-old outworked him on the campaign trail. Saira Blair has been busy this week. She's president of the Key Club at Hedgesville High School in West Virginia, and she's been participating in a variety of activities as her class prepares to graduate next week. Oh — and on Tuesday, she won a primary election for the state House. Blair, who is 17, unseated two-term GOP incumbent Larry Kump. The district is heavily Republican, so she'll be favored to win the seat in the fall. She may be a teenager, but she sounds like a concerned parent when she talks about why she ran. "A lot of my friends around the state have been able to find a good education in the state of West Virginia, but they haven't been able to get a job," she says. Blair encouraged her friends to vote, letting them know they could do so as long as they will turn 18 before the November general election. That helped her come out ahead in a low turnout election in which about 1,600 votes were cast. She had a little help from her family, as well. "It didn't come out of the blue because her dad, who is the state senator for this area, was working vigorously on her behalf," says Kump, the defeated incumbent. "There would be something wrong with a dad who wasn't willing to help his daughter." As a result, there have been only a half-dozen teenagers elected as state legislators since 1998, out of maybe 50,000 such elections. All but one of them won in New Hampshire, a small state with a huge Legislature of 424 members, creating so many politicians per capita that it's not unusual for husband-and-wife teams to both serve representing the same address. "I found that the general response when I was elected at the age of 18 was: Fantastic — now give us a reason to vote for you in two years," says Joe Sweeney, who was elected to the New Hampshire House two years ago. At first, everyone — media outlets, constituents, other politicians — wants to talk to the new kid at the Capitol. But the novelty quickly wears off, says Derrick Seaver, who was elected to the Ohio House at 18 back in 2000. "Honestly, it's a great experience no matter what age you are, but obviously being 18 is different," he says. Mark Barney, Blair's civics teacher at Hedgesville High, says they discussed her campaign in class. Like many people in her district, he thinks it's a great thing she decided to run for office at such a tender age, rather than starting out cynical about politics. "Craig was in the House for eight years," says Andrea Blair, Saira's mother, referring to her husband. Craig Blair won election to the state Senate two years ago. "She was little when he got started. She went to tons of meetings, did campaign help and held signs when he was running." Even Saira's Democratic opponent, Layne Diehl, says she admires someone so young for getting involved in civic life. "There are too many young people who aren't paying attention to what's going on," adds Denny Hedges, who works in auto sales in Hedgesville and supported Blair. "She evidently has the right views because she defeated an incumbent, so people are definitely ready for a change." Blair had a small social media presence for the primary. She ran the old-fashioned way, knocking on doors, running print ads and sending out hundreds of handwritten notes. "She mobilized her people; she was effective. She just did a better job of campaigning," says Kump, gracious in defeat. Blair said the issues she heard about the most as she talked to voters were jobs, gasoline prices and the Second Amendment. She contends that her party, which has struggled to appeal to young voters in recent years, should have no trouble in the future. Republicans, after all, are widely expected to win control of the West Virginia House for the first time since 1928. "It's wonderful that my generation is learning they don't have to be 40, 50 or 60 to realize these conservative values benefit them," she says.